How fit is your parts handling? Pumacy Technologies AG has been developing and implementing strategies and processes for professional parts management in medium- to large-sized companies for more than 15 years. In the early years, parts administration involving information technology was carried out almost exclusively with traditional parts management software. These days, alternative solutions are available thanks to advances made in the development of knowledge management, knowledge-based engineering or the possibility to analyze large databases. 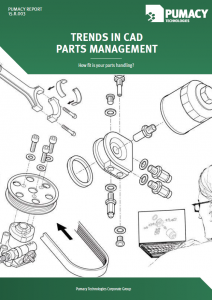 The purpose of this “Trends in CAD parts management” report is to account for these changes, to highlight the essential tasks of parts management from a current point of view and to outline actions for optimizing it. Structural parts are basic elements used to create complex products. Insofar, the management of these parts includes all associated administrative tasks and supporting processes aimed at safeguarding the quality of the parts and at saving costs. The results of this report are based on an online survey conducted in the German-speaking region, predominantly among industrial enterprises with more than 250 employees, with participants working in product development (including research), production, manufacturing, sales and marketing. You can order the study free of charge at the end of this site! 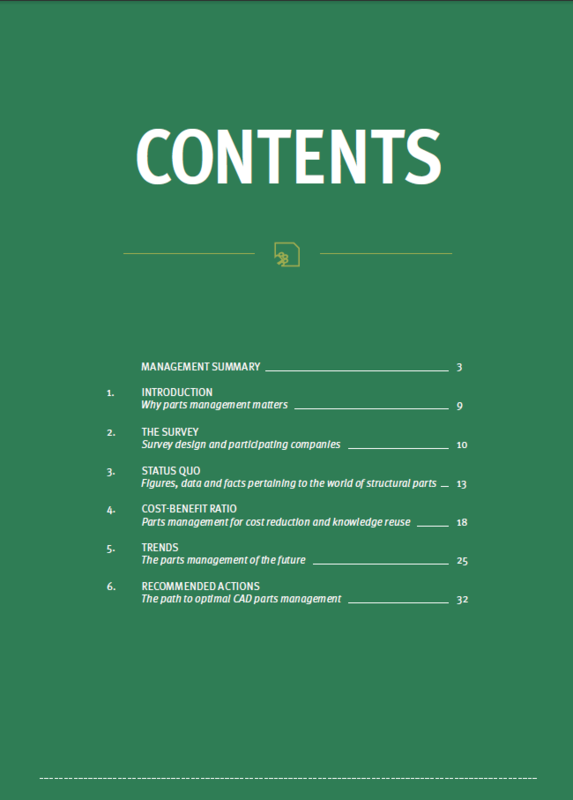 The term “parts” is generally used throughout this report, irrespective of whether it relates to traditional structural parts, components, A, B and C class parts or 2D and 3D CAD parts. Nearly half of the surveyed companies are administrating an inventory of more than 100,000 parts. 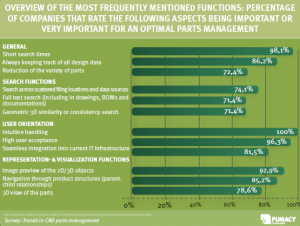 Thus, the majority is already using a dedicated parts management software solution. Irrespective of the size of the companies, 73% report a 4-digit and higher rise in the number of parts added each year. In two thirds of the companies, more than 60% of the CAD data is archived and hence at risk of fading into obscurity. Large parts quantities and high parts increases bear the risk that many parts are rarely reused. In 42% of the companies, more than 100 users have access to CAD-relevant data. Almost half of the companies are working with more than one, 21% even with three CAD systems or more. Catia V5, SolidWorks, AutoCAD and Pro/ENGINEER are the CAD systems most commonly used by the respondents. Aside from quality assurance, cost reduction is the main purpose of parts management. 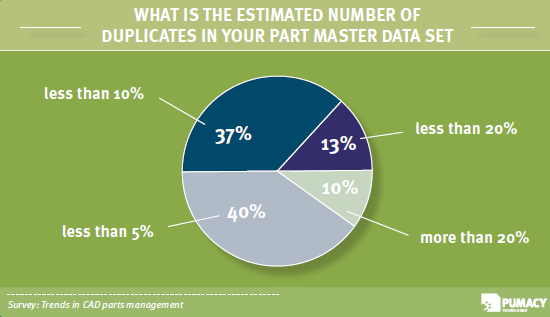 Especially the creation of new components is generally associated with high costs: the survey shows that almost all divisions are affected by the set-up of a new part in the part master data set. The associated expenses reach the highest level in production & manufacturing (54%). Costs are also incurred for the creation and administration of duplicates. Insofar, the effectiveness and efficiency associated with searching for and finding duplicates is by far the most important property of a powerful parts management. Indeed, as many as 40% of surveyed companies estimate that they handle fewer than 5% of duplicates, but system optimization and knowledge distribution can achieve considerable savings even with parts quantities in this order of magnitude. In addition, duplicate parts can be tidied up and removed with an annual inventory. 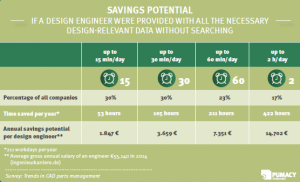 Performing a search is time-consuming and offers a considerable savings potential, irrespective of whether it yields a result: with a powerful search, a design engineer can save an average of 47.5 min/day. 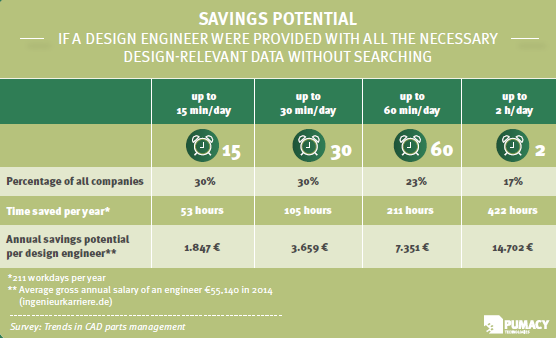 Thus, a company with 30 design engineers would be able to reduce its monthly costs by 14,605 Euros. 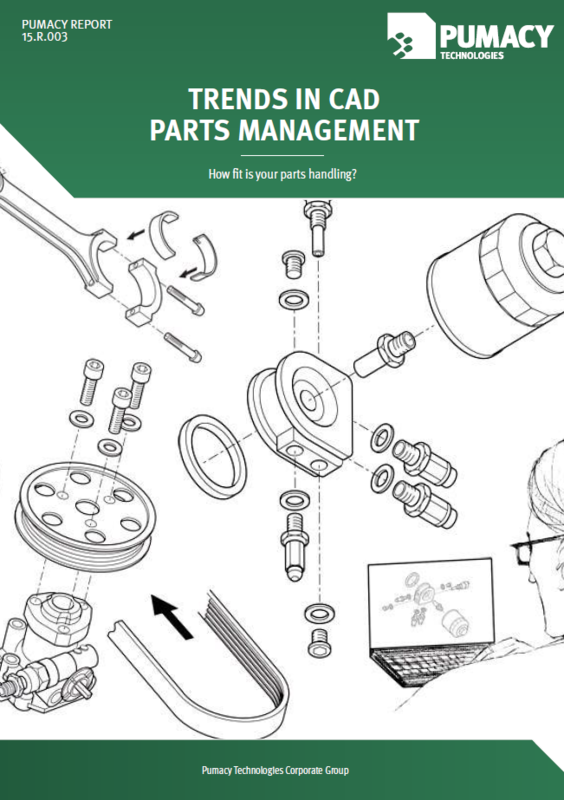 It becomes apparent that the search is a key element of optimal parts management. This is relevant especially for the decision with regard to softwarebased support: short search times and keeping track of the variety of parts at all times are most important for the user. Big data: The parts inventory is growing rapidly. The greater the data variety is, the more important it is to have a tool that clearly illustrates the correlation between these data. Process orientation: The focus is shifting toward methods aimed at implementing and realizing processes. Need for communication: A software solution that allows the cross-departmental coordination and promotes the in-house communication is a clear advantage. Reusing design know-how: A benefit is achieved by sharing design know-how within the company. Search-based parts management: New search technologies and search-based algorithms are the centerpiece for smart and fast searches. User orientation: Intuitive handling, high user acceptance and seamless integration into current infrastructures are essential for the decision. 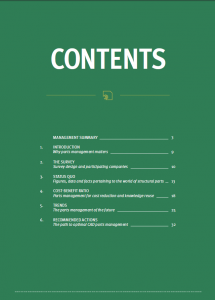 Request complete Study "Trends in CAD Parts Management"